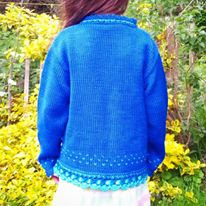 About a week ago, I finished the blue cotton cardigan I started for M back in March. 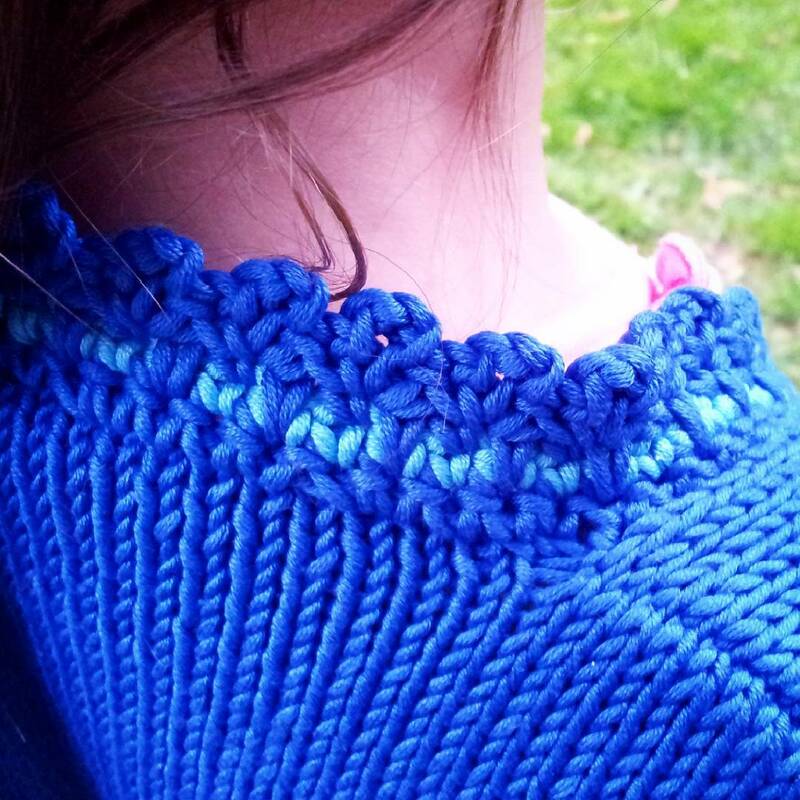 Considering I swatched for this project in February, this means it has taken me over three months to knit a garment to fit a nearly six year old. I really am not a speedy knitter these days. 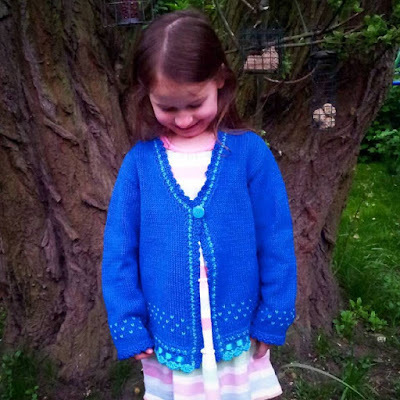 Fortunately, M had asked for a summer cardigan so my timing is impeccable. After a lot of thought, I decided to make the Sirdar simple cardigan one more time. I've already made this pattern twice before (last year and in 2014), so it was a familiar make. I wanted to make the cardigan in a size bigger than M, so for a 7-8 year old, which presented a challenge as the Sirdar pattern only goes up to 6-7. I was all set to rework the numbers, but started with my swatch and no matter how I tried I could not get my chosen yarn (Drops Muskat) to come out to the specified gauge of 22 stitches x 28 rows in stocking stitch gives a 10cm square. I could have tried dropping needle size again, but was worried about drape and ending up with a cotton cardigan which was too stiff. 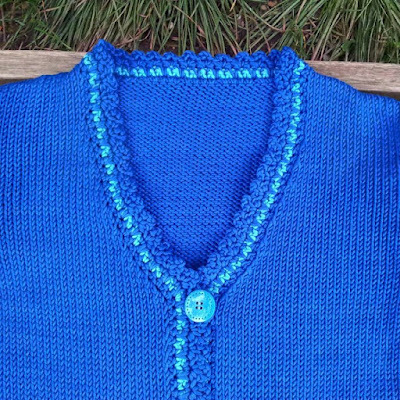 After working the numbers, I decided to knit this cardigan with 4mm needles. The resulting gauge made the piece a couple of centimeters bigger across the chest, bringing the expected size closer to that needed for an eight year old, which was what I needed. Having made this cardigan before, I decided to mix things up a bit by adding stranded colour work to the bottom of the body and sleeves. This was a new technique for me and keeping tension even proved tricky, but I was pleased with the effect which was very pretty. I was astonished at how quickly this cardigan ate the Muskat. The pattern predicted seven balls and I'd bought eight. By the time I'd finished the back, I knew I'd be in trouble as I'd gone through nearly three balls! By my estimates, I'd run out of yarn on the second sleeve... So I hastily bought another five balls of the same dyelot, because I wanted enough left over to add to another project. I am so glad I did, as this project used nine balls of the main colour and one ball of the contrast. The original Sirdar pattern calls for a knitted border, but the first time I made this I found the border wouldn't lie flat and the collar was messy. I much prefer a crochet border, so I decided to do my own thing. Getting adventurous with the collar. Stranded knitted colour work, with a spiked treble, eyelet and scallop edging. M wanted a ribbon and a turquoise scallop to match the turquoise stranded work, I fancied doing some tiny scallops and spiked stitches, so we ended up with all of those things incorporated into the bottom hem, fronts, collar and cuffs. While I enjoy knitting, I'm more confident with crochet and as such I'm happy to experiment. 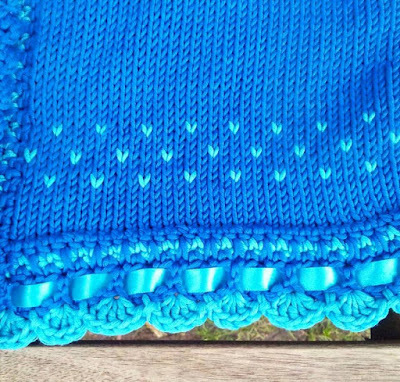 At one point I was afraid I'd overdone it, but after the last stitch was placed, I decided the crochet finish brings the final garment alive. Finally, M chose the button to match during a trip to the local yarn store. 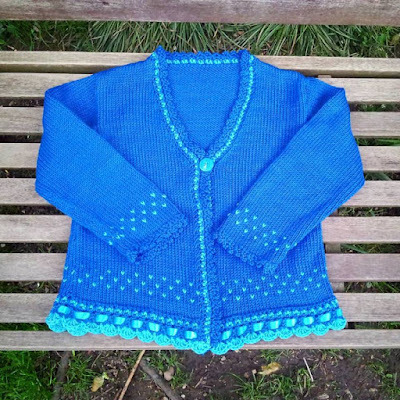 The end result is a very pretty cardigan. It is deliberately too big, which is why it currently sits more like a jacket, but by this time next year I think it will fit my daughter well. She may even get a third year out of it! M loves it, so everyone is happy.